SiteGround web hosting is one of the best in the industry with its extensive web hosting packages, top-notch support, and scaling technology. 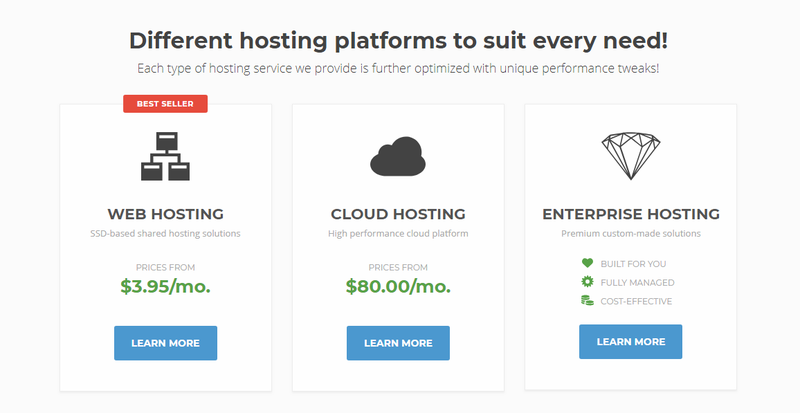 New users can begin hosting their sites, blogs, and online projects for as little as $3.95/mo. Or can upgrade to cloud hosting ($80/mo) and/or enterprise solutions. Every SiteGround hosting package comes packed with rich features, WordPress support, and a slew of helpful plugins and applications to improve speed, security, and manageability. Their platform uses SSD hard drives on all offering making them one of the fastest servers you can host on. SiteGround’s adoption of the latest Web technologies, security policies, and compliances remove headaches and annoyances often found elsewhere with other providers. Their platform has a 4.99/5.0 rating – and it shows! We know SiteGround is a stellar service, but you’re here for the SiteGround affiliate program. This places their affiliate payouts on-par with other major brands like Bluehost, HostGator, and a2 hosting. Except, there are added benefits to a SiteGround affiliate partnership including weekly payouts, short 30-day confirmation period, and no minimum sales. You’re in good hands when working with the SiteGround team. This SiteGround affiliate review looks for three major items: payouts, support, tracking. SiteGround does all three spectacularly. The wide selection of hosting packages, fair pricing, and incredible speeds are more than the few reasons you need to share your SiteGround affiliate links and promotions to your audience. We think you’ll have problems adding their deals and offers to your list of hosting providers and services. Overall, the only thing holding SiteGround back is its outreach. We believe a lot of affiliates would switch to SiteGround if they offered a slightly higher commission. This would make them the new standard for web hosting affiliate marketing compared to the ever-popular Bluehost. The SiteGround affiliate program is available, by default, to its customers. Though, you can join the SiteGround program through their affiliate portal page providing basic contact and business details. This open web hosting partnership should be one of several added to your line-up. SiteGround has, year-after-year, proved to be one of the fastest web hosts in the market. Speed matters when it comes to user experience and search engine optimization. Promoting their services gives your affiliate sign-ups those added benefits from the get-go. Promote the great pricing, storage, and options and you’ll have no problem earning those $50 initial sales. Then, scaling up to the higher $100+ earnings. Should you become a SiteGround affiliate? Absolutely!